Use the back door. Avoid the lobby if you’re carrying luggage. Don’t talk to neighbours. Say you’re visiting a cousin. And most importantly, don’t mention Airbnb. As cities and buildings around the world crack down on Airbnb and other short-term rental platforms, some hosts are asking guests to lie about who they are and why they’re there. For vacationers or those looking for a weekend getaway, Airbnb offers convenient and affordable accommodations, giving guests a base in local neighbourhoods rather than a traditional hotel. For local governments and residents, however, Airbnb and others are increasingly being blamed for squeezing affordable housing and circumventing the taxes imposed on hotels and other corporate operations. A number of Canadian cities, including Toronto, Vancouver, Ottawa and Montreal, have all moved to tighten the rules around Airbnb and other short-term rentals, through methods like taxation, certification and limits on how frequently a space can be rented out. 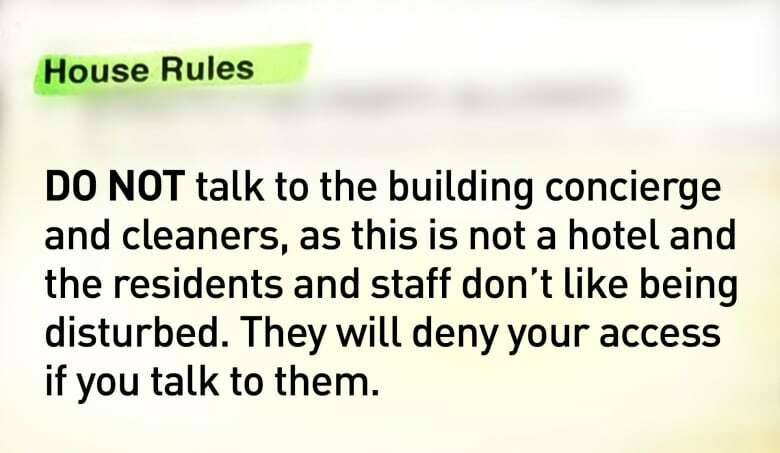 But it’s also happening at a micro level, with individual condo boards issuing guidelines or outright bans for owners and tenants in their buildings. Guests are sometimes caught in the middle. That’s what happened to Patricia Payne, of Labrador, whose trip to Toronto took an unexpected turn when she ended up booking one of these “rogue” units. “I felt like a criminal, I was afraid to make eye contact with anyone,” she said. Payne was in the city with her boyfriend to visit family, who recommended she try Airbnb for a potentially cheaper option in a more convenient location. She found a condo close to her aunt’s home. 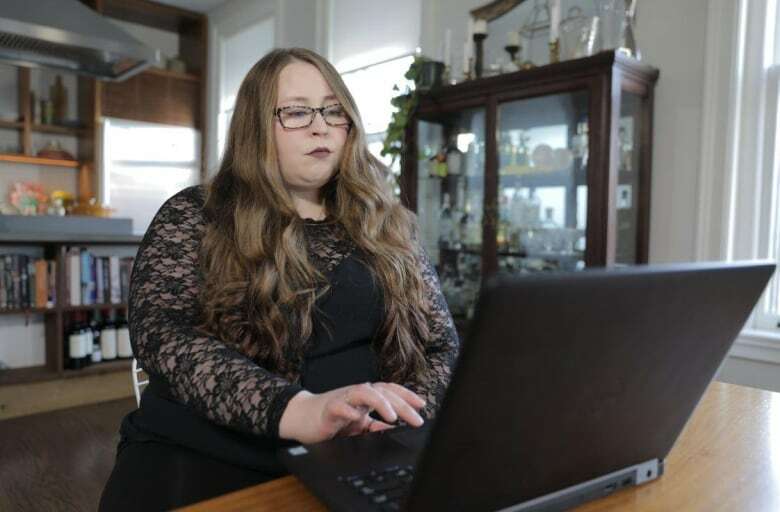 But three days after booking, her host sent her a list of rules that weren’t outlined in the listing posted on the online home-sharing platform. “He told me that if anyone asked, I was just here to visit him and his family, like we were friends … and not to speak to security or the concierge or really anybody who worked there,” she said. By the time Payne received these new rules, it was too late to cancel without losing money. 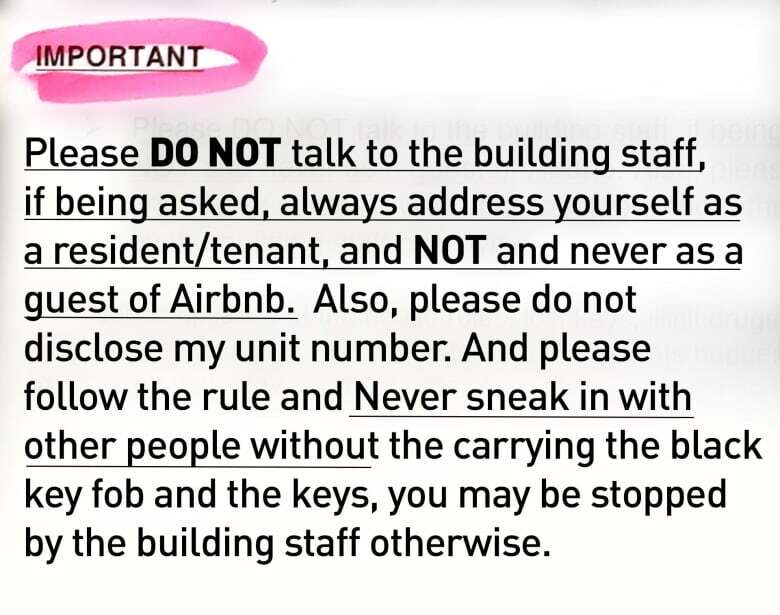 A Marketplace producer went undercover in the same condo and received a similar set of rules. Payne ultimately decided to stay at the listing, but said she felt too uncomfortable to use the building’s advertised amenities, like the pool and hot tub. “I was afraid of being kicked out mid-vacation and being stuck with nowhere to stay,” she said. Payne isn’t the only one who has experienced this. With data supplied by AirDNA, Marketplace analyzed reviews posted on Airbnb in 2018 from major cities across Canada. One listing in Ottawa had many reviews mentioning having to hide the fact that guests were staying in an Airbnb. A Marketplace producer booked a stay with the same host. They were given a long set of strict rules, instructing that the keys were to be “discreetly” collected from a lockbox. The rules also suggested guests use the parking-garage entrance if travelling with luggage. And upon entering the apartment, more rules were waiting in a printed, framed document on the counter. 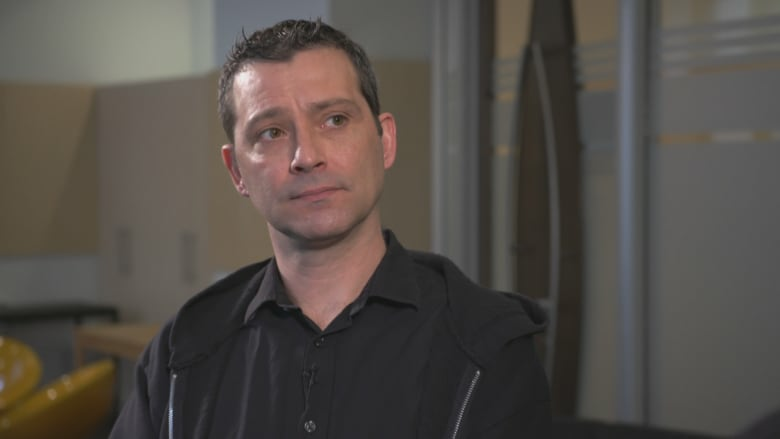 Chris Devita is the president of the condo board at 600 Fleet Street, a downtown Toronto highrise that banned short-term rentals about eight years ago. He says he understands why some condo buildings are banning Airbnb, saying too many in one building can mean a lack of community. “You can’t be friends with people who’re just ghosts … They come and go,” he said. According to Devita, the consequences can be even more serious. Toronto is no stranger to crimes happening at Airbnbs. In 2018, police confirmed that they were seeing a trend of human traffickers using Airbnbs in the Greater Toronto Area. And there were calls to re-examine the rules around short-term rentals again earlier this year, when a video of a woman tossing a chair off a highrise balcony went viral. It is believed that Marcella Zoia, a 19-year-old now facing charges of mischief endangering life and common nuisance, was staying at an Airbnb. Airbnb declined Marketplace‘s request for an interview and instead provided the following statement when asked about covert listings. Devita said his condo building tried to work with Airbnb, suggesting an opt-out option where addresses that have rules against short-term rentals can be excluded from the platform. After no response from Airbnb, he says the building took matters into its own hands. Airbnb says that it is up to hosts to follow local laws and regulations. Still, Devita said his board hasn’t ruled out allowing short-term rentals in the future.